Cat Rescue & Adoption Network cannot guarantee acceptance of any animal. Fill out the form below and submit it. If we are able to accept your cat, you will be notified. Is this cat up to date on its shots? Has it been checked by a veterinarian? Did the veterinarian check for or find a microchip? If the cat is not yours, have you tried to find the owner? Solid, Tabby, Tuxedo, Other Bi-Color, Tortie, and Calico. If CRAN agrees to take this Cat, are you willing to foster it until we can find it a home? 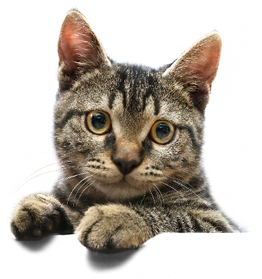 How did you hear about Cat Rescue & Adoption Network (CRAN)? Who referred you to CRAN? Do you currently Volunteer for CRAN?